This is an ad for Schick Quattro Titanium disposable razors. Get a smooth, sculpted shave with the new Schick Quattro Titanium Disposable. The only disposable razor with an edging blade for precision and 4 titanium-coated blades to help you shape as you shave. Well, I have to admit that the tagline fits with the image of one of Michelangelo’s sculptures (the famous David, of course). He said that his sculptures were already fully formed inside the blocks of stone he had and that it was his job to free them. 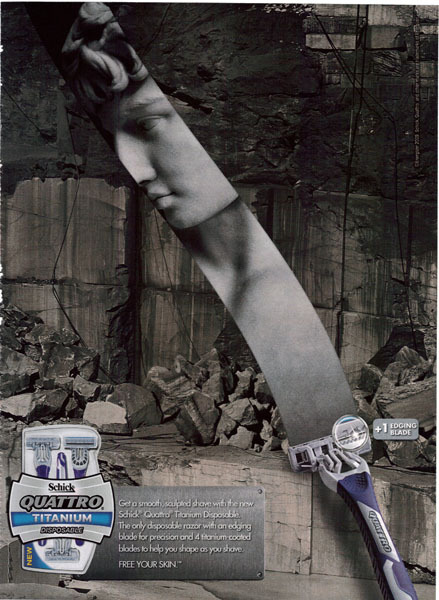 The problem with the ad is that it sounds to me like it’s suggesting you can actually sculpt your own face with this razor, and I’m guessing that’s not really the case. A razor merely lets you shape or cut off the hair you have, not actually remold your skin. And you can create some illusions about your face shape with clever shaving, but few people actually have the skills to do so and those who do aren’t likely to be using disposable razors to do it. I think this is an interesting ad, but I’m not sure it’s effective for a razor. I probably would have stuck with something more… facial-hair themed. This entry was posted on March 31, 2010 at 12:00 pm	and is filed under Beauty. Tagged: print-ad, quattro, razor, schick, titanium. You can follow any responses to this entry through the RSS 2.0 feed. You can leave a response, or trackback from your own site.